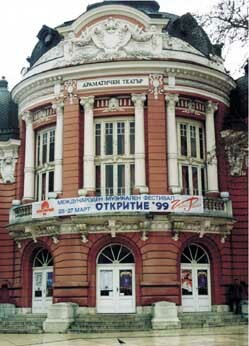 In 2001 the Discovery International Pop Music Festival - Varna is getting on for 10. It’s begining becames a history and the first anniversary imposed it as a factor for cultural development with not only national but also international significance. The Discovery Festival is the only international known pop music institution in Bulgaria. IN this instituion are crossing in an unique way local, regional and global the music of Bulgaria and of the Balkans and also the music of the different regions of the world. The world of music shows an always growing interest to the festival in Varna. A member of FIDOF and winner of several of it’s awards, the Discovery Festival is in a good cooperation with it’s partner-festival all over the world. Alredy 10 years on the stage of Discovery perform talanted singers from Turkey, Serbia, Macedonia, Romania, Russia, Georgia, Armenia, Albania, Israel, Malta, Egypt, Uzbekistan, Cyprus, Mongolia,USA, Switzerland. Togheter with the singers from Varna and Bulgaria this young artists present to the tousend fans of the festival the most harmonious bouquet of melodies, carrying the atmosphere of the world’s cultural variety. Accents of the last years: · Discovery is taking part live and multimedia: it is organised in co-operation with the National Broadcasting Company- Varna, is transmitted by many televisions, it’s editions have a CD archives. · Discovery is a bond of the contemporary youth music and of the Black sea cultur tourism · Discovery discoveres not only singers, but also new songs, produced ecpesially for the festival on behalf of it’s rules. · Except by the private business and foundations, the Discovery Festival is supported by the Municipality of Varna.